New England Great Whites to be Wrangled – Ya Like Dags? I haven’t written about New England great whites here in a while, though I do chime in about new sightings and info on Twitter. However, it looks like the sharks of the East Coast are attracting attention from more than just me. It looks like the show “Shark Wranglers” will be focusing on the white sharks of Cape Cod next season. Going by precedent set in other waters where the Shark Wranglers have fished, their trip to Massachusetts may not be without controversy. White shark being wrangled. Image from natgeotv.com. “Shark Wranglers” is the same crew (minus Dr. Michael Domeier) formerly featured on the show “Shark Men” on the National Geographic Channel, which itself used to be called “Expedition: Great White.” These guys specialize in a unique, possibly unnecessarily-invasive procedure to catch and tag large sharks. Their methods involve hooking the sharks and attaching buoys until the animal tires, at which point it is lead up to a movable platform on the side of the boat, raised out of the water, and has a satellite tag bolted to its dorsal fin. These methods have been controversial, and it doesn’t help that the Shark Wranglers are developing a reputation for being bad guests. The first major controversy involving the then-Shark Men was the apparent foul-hooking and mutilation of the white shark “Junior” off the Farallones. This proved to be unrelated, but still nearly cost the team their permit to work in the marine preserve. Then this spring, a bodyboarder was killed by a shark attack not far from where the Shark Wranglers had been working in South Africa. Again, officially no direct responsibility was found, but two possible incidents in two years is impossible to ignore. Are the Shark Wranglers too cavalier with their methods and safety standards, or are they just too easy a target due to their high profile and the fact that they work with dangerous animals? Also worth asking, with personalities like Dr. Greg Skomal (who put on a great show during last year’s Shark Week) already working on great whites in the area, are the Shark Wranglers even necessary? They have the potential to provide some good information on this up-and-coming shark population, but only if they can avoid acting like a bull in a china shop. In the process of putting on the show are they loosing credibility or gaining credibility? Outreach is an increasingly essential part of doing science, and I don’t begrudge any scientist who is able to keep an audience’s interest without compromising their work. I thought Greg did an exceptional job during Shark Week last year (he was featured on “Jaws Comes Home”) showing a scientist at work and, perhaps most importantly, making it look fun without having to resort to a lot of gimmicks and grandstanding. I don’t think a scientist being entertaining hurts their credibility at all, as long as they’re promoting science or promoting their findings above promoting themselves. Thank you for your post. I’m glad word is spreading about the Shark Wranglers coming to the Cape. Whether people support the show or not, I think the open debate is important. The show has had controversy surround it for good reason. While the mutilation of ‘junior’ was not directly linked to Fischer’s methods, the ‘Shark Men’ admitted to hooking that particular shark in the throat and releasing it with part of the hook still attached. 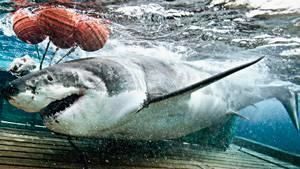 In South Africa, the show was not tied to the surfer’s death, but they did admit to killing one white shark during their invasive catch and release methods. In the Boston Herald interview last week, Fischer claimed his methods are “safe.” I don’t see how methods which cause injury or mortality to a protected species in regulated waters, under the watchful eye of scientists, can be considered safe. There are many of us, Massachusetts residents, who are very supportive of Greg Skomal’s tagging efforts. He has been working effectively with Capt. Billy Chaprales of the Ezyduzit to satellite and acoustic tag white sharks off the Cape. These tags have been used to track migration patterns (satellite tags) and to alert local officials when sharks swim near receivers set up close to shore (acoustic tags). The white shark is already a protected species in the US. Our local biologist has already been tagging white sharks using a minimally invasive method. The Ocearch vessel has already tagged and sampled numerous white sharks around the world. The reality TV show just finished filming in South Africa where bacteria samples were collected and stress physiology tests done, two things that are also slated to be done in waters off the coast of Cape Cod. It seems reasonable at this point to ask, what are the actionable conservation goals of the project here? You hit the nail on the head with what’s been bothering me the most about this: the Shark Wranglers aren’t likely to do anything off the Cape that local researchers aren’t already doing better. It seems like a high risk with a high profile for something that’s ultimately kind of redundant science-wise. Great article. Thanks for keeping us updated.